Eating peanut butter every day on the Below the Line challenge in no way diminished my fondness for the stuff. As a child I found it unpleasantly claggy and did not enjoy the taste, but as an adult something changed and now I love peanut butter in both savoury and sweet recipes, crunchy or smooth. I found I had just over 100g left of my value jar, and since the rest had gone into savoury crackers and salad it was time to bring on the sweetness. 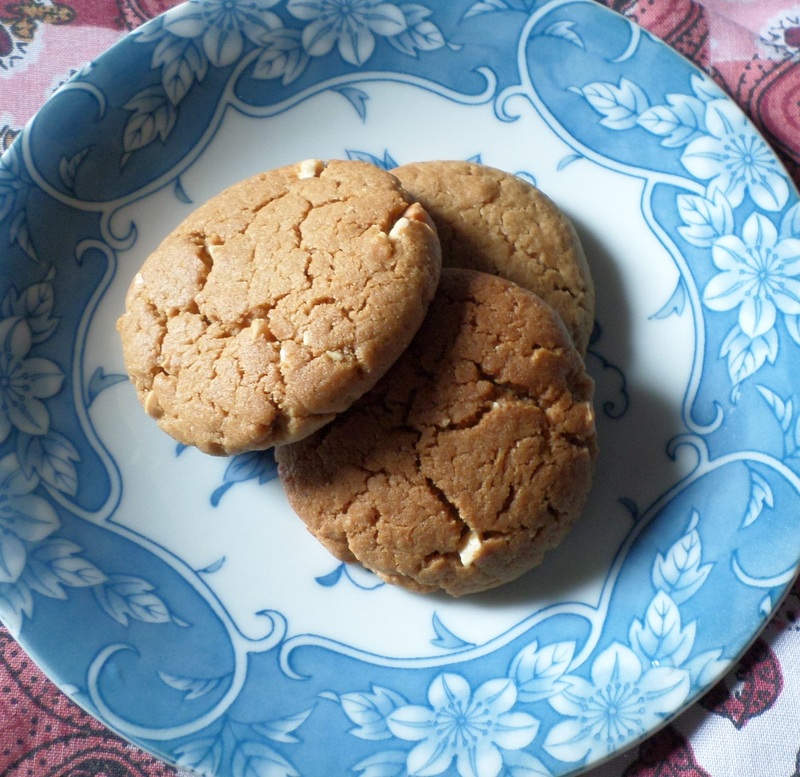 I whipped up a batch of simple cookies with the help of some brown sugar and a dash of rum. 10g rum (optional, or you could use vanilla. I’m finding the alcohol base in flavour extracts goes a long way to boost baked goods, regardless of the ostensible flavour, and using supermarket brand rum is about half the cost of vanilla extract). Weigh peanut butter into mixing bowl. If it’s the last of the peanut butter in the jar, add the oil and water to the jar and shake vigorously to help dislodge the last of the stuff hanging on to the bottom and side of the jar. Scrape into mixing bowl. Add the rum and sugar, and mix it all up to a runny paste. Add enough flour to make a soft dough. In my case this was around 175g, you might try a bit more or less. Mix in with a table knife or spoon until no dry flour is left. Take spoonfuls of dough and roll into the obligatory walnut-sized balls. Flatten down a bit and place on a lined baking sheet in a 180c/350f/gas4 oven with a cm or so space (they do spread a bit) for around 15 minutes (check after 10 to make sure they’re browning evenly and not burning) until just beginning to turn brown. This length of baking turned out crunchy-topped biscuits which are still a little soft and cakey on the inside, if you want them crunchy all the way through turn the heat down a notch and bake for longer. These are a simple cookie which I think would go nicely with a banana milkshake. Sultanas and/or chocolate chips would be a great addition as well. Maybe next time! I love peanut butter too and these look yummy.